My father once wisely said and I quote. This was after I was voicing my problem of the day. How true it is. The sky is usually blue and always returns to blue. The longer I have lived the more I appreciate this truth. Things that are all consuming in our lives at any instant in time will eventually be only memories – if we do remember them. Many issues that we think are so important actually won’t matter in a year let alone 5 or 20 years. Issues are like the clouds – they come and go, they can be light and fluffy or ominously dark blocking out the blue. Eventually, though we always enjoy another brilliant blue sky. As I sit enjoying the sun shining down on me with an intense blue sky overhead it makes me smile and be thankful. 9 ways to break through the dark skies of divorce! When in stressful circumstances learn to live in the moment as much as possible. Most stress is created by ourselves worrying about the future and reliving the past. When we can focus on the present moment in front of us, it is a relief to our system and allows some well-needed relaxation. Set up good routines to get you through the day, especially if you have children living with you. We all need routine, especially during tough times. Routines can carry you through the day without having to make too many decisions. When you are in turmoil you can exhaust your decision-making ability so save your energy for the important choices you will have to make. Self-care is critical. Look after yourself with all the love and care you would give someone you adore! Treat yourself with dignity, respect, and kindness. Do not give up control. Sometimes it seems like you should let others guide you. Depending on who is guiding that can be a good thing or a bad thing. I always listened to anyone willing to offer advice, then made my own decision to follow it or not. I always said, “Thank you I will take that into consideration and make my own decision”. Don’t argue with advice. Just take it and then make your own choice, follow your gut to either take the advice or discard it. You do not have to justify anything. Know your options. Sometimes people seem to become paralyzed and stuck, hoping things return to ‘what was’ instead of learning what new possibilities exist. If you are facing a divorce – talk to professionals and understand the choices specific to your situation. The reality is usually less stressful than what our imaginations create from the unknowns! Give yourself the support of professional help if you are not coping well or even if you are. They can help you find resources to better cope with your burdens. Recognize you cannot do it all. Ask for support or hire help if you are able. Delegate. Learn to say “NO” when required! Believe in yourself. If you think you can, you will. If you think you cannot, you will not! Realize that your beliefs can limit you and changing your thinking can be very liberating. Remain optimistic that things will get better. Things will definitely be different. You cannot control how other people think, feel or act but you do control how you think, feel, act and react to every event in your life. 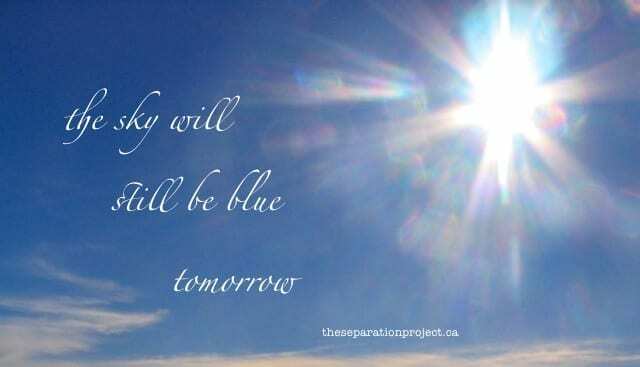 Know that the sky will still be blue tomorrow! Someday in the future, you will be sitting under the big blue sky looking back at this difficult time in your life and smile because you did make it through! Thanks for your time! If you are going through a divorce, separation or just a difficult time I hope you find these ideas helpful. Remember you are not alone! If you or someone you know would like help with the journey please Contact me! It is so wonderful that you are available to people going through this difficult time. I’m sure there was nothing like this when my ex and I split up (over 20 years ago). When I think back, I don’t know how I coped with giving up my dogs, my home, my friends and my job, all as a result of the separation, yet somehow I did. You showed great resilience Janet! Thanks! It is remarkable how we can rebuild. 20 years out I am sure you can look back now and see the positive growth you went through to get to where you are now.